After arriving in Finland on a coal freighter, Khaled, a Syrian stowaway, applies for asylum without much hope for success. Meanwhile, Wikström, an eccentric travelling shirt salesman, decides to change his life and buys an unprofitable restaurant. Can these two men help each other out? The Finnish director Aki Kaurismäki’s films are often marked by a particular kind of humour. He can put the ‘dead’ in ‘deadpan.’ This was particularly true in such ‘90s films as The Match Factory Girl and I Hired a Contract Killer, tales of privation and depression that treated these subjects with both gravity and acknowledgement of an overall absurdity in the human condition. Mr. Kaurismäki’s protagonists are often drink-soaked sad sacks who achieve a kind of sodden resignation. In recent years, though, the director has found something to believe in, and this has added a humanist dimension to his pictures that is both pleasing and moving. His 2011 Le Havre was about a shoe-shine man in the title French port who takes in a young African teen who arrived on a container ship. Aside from being an excellent illustration of the Christian proverb about loving thy neighbour, it was also a warm and funny film standing up for the larger principle of immigration. 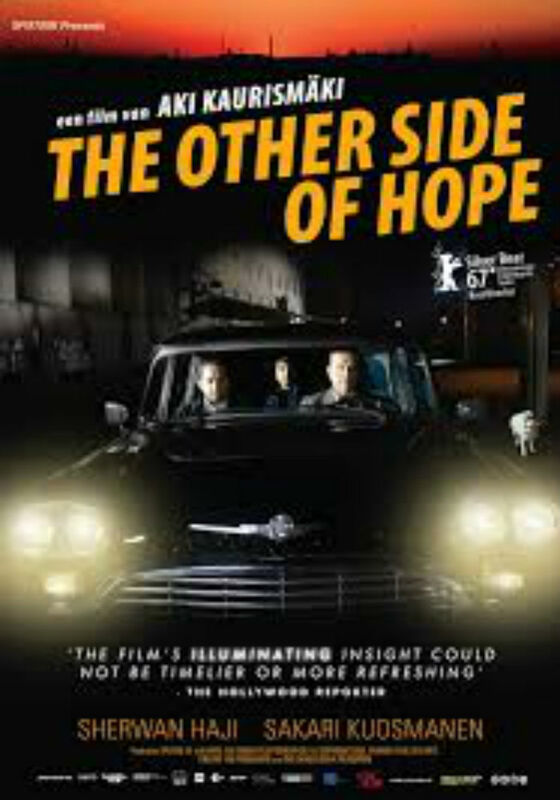 So too is his latest feature, The Other Side of Hope, set in his native Finland. One of its protagonists, Wikström, drives around in a sleek, oversized black car of a vintage unknown to me, in keeping with the director’s insistence of never depicting a post-1962 auto. Wikström is a man at loose ends, having dissolved his marriage and subsequently won a small fortune at poker. He decides to invest that cash in a small bar/restaurant that’s very down at heel, and whose staff is highly ambivalent about the quality of attention that comes with a new owner. In the meantime, Khaled, a Syrian refugee who’s come in via a coal ship is being processed through Finland’s supposedly humane immigration system. But once he’s very politely rejected, he goes on the lam. He is desperate to get word from his sister in Syria while he is in Europe, and to arrange her passage out of Syria. Once Khaled and Wikström’s paths cross, hope is revived, and comedy blossoms. But Khaled’s quest is made difficult by belligerent racist skinheads. By the time Khaled is actually put in touch with his sister, the race against time is even more critical. The movie expands upon Kaurismäki’s central mode of observation and delivers some trenchant views about the immigration experience from the side of those seeking asylum. While in the detention centre awaiting a ruling on his case, Khaled is told by a friend not to appear too cheerful, as people will take him for mentally disturbed. Kaurismäki makes these bigots look ridiculous. The film’s suggestive title lingers at the end, leaving a question mark that the viewer will have to turn over personally.